As I have mentioned in previous posts, I have days when I handle the past few months better than others. Even on the good days inevitably there will be a moment or two that I find myself struggling with the weight of it all. Feeling as if I don't know how I'm going to do it all. We may be home now, in fact Kaleb has officially been home for a month now, but it has become a new set of crazy. Currently we are averaging two doctor appointments a week and caring for a baby that comes with wires and a cart of equipment. Last week I had one of these moments as I drove to the health department to fill out paperwork for Kaleb to begin therapy. On my drive I was thinking about the fact that I was signing my child up to begin physical therapy, occupational therapy, and speech therapy. I was also worried about an insurance issue with one of Kaleb's monitors, my mind would then bounce to all I needed to do in preparation for the upcoming semester, and trying to figure out how I was going to make it all work. It felt like too much. Yes, I am guilty of having pity parties and feeling sorry for myself. It is easy to slide into the mindset, "this is not what I pictured, I'm not sure I can handle it." Then the words that have been said to me many times the past few months came to me, "manna in the dessert." You see I have a dear friend that seems to be the person who always seems to call or text me when I'm at a low point. After listening to me vent or cry the past few months she always says the same thing to me, "this is your manna in the dessert time." Her reference coming from Exodus 16. In this chapter of Exodus the Israelites every day were to gather all the food they needed for that day and no more. If they tried to take more it would ruin. Keri has constantly told me this to remind me that he will give me all the strength I need for the day. He will give me the strength I need for THAT day and no more. I don't need the strength to get ready for tomorrow or next week, it won't keep. One day at a time, strength for one day at a time. As someone who is futuristic, in fact it is even one of my top five strengths in personality assessments (Strengthfinder 2.0), this is not easy to do. 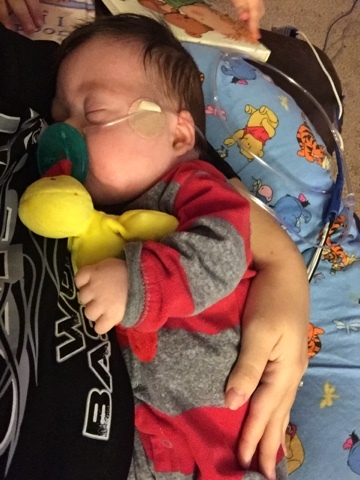 With Kaleb and the uncertainty of his progress and health I definitely find myself wishing for time to pass so that I know more of his development. How long will he be on oxygen, how long until oral feeds, his heart defect, and any issues due to his ds/preemie/IUGR. The uncertainty can be terrifying. However, it is a fruitless effort, my worry for the future will do no good for today. I can't borrow strength for today to take into the future. No more than I can store up strength and build muscle to take in the future. You can't stock pile strength so that you can take a break and have it in the future. If you do not continue to exercise or lift you will lose the strength. As the saying goes, "use it or lose it." The same goes for the strength needed as we go through this time. It's a daily decision that I can do this with His help. I can rely on Him and His strength to help me through this day. I can find the strength to once again navigate and untangle myself from the wires hooking up to the oxygen and monitors. I can choose to be grateful for this life that is mine when I see other journeys that do not consist of therapy or in and out of doctor's offices. I can let go of my consuming fear of Kaleb's future and be here for the present and these baby cuddles that I am so grateful for. I can do what I can do this day and let go of the rest. I will find the strength to let go and be present. I think this may be my favorite post yet!